January has been a tough month for measurable progress. It’s been cold (like, for Texas, anyway). So cold, that we iced up one day! I’ve been taking care of some wedding stuff, and some work stuff, and some school stuff, and I had some friends in town this weekend… And hanging with them was much more fun than donning a respirator mask and safety goggles to sweat and play in the rust. I’m feeling a little down right now because we haven’t made the progress that I thought we would have by now. The last two times we’ve been out to the trailer, we arrived several hours behind schedule, and hit what felt like a hundred roadblocks that prevented us from reaching our end goal for the day. Trailer reno is hard, dudes. But… I’m gonna throw down a little progress report, in the hopes that it will lift my spirits, and bring into my focus all of the accomplishments we’ve achieved since my last update. Let’s get started, shall we? So, the last time I shared our progress, it was really short blurb with a lot of pics. And reviewing that post just now as I prep to write out today’s post, I can see that we have in fact gotten a TON done. We are still far off from being able to even hang out in the trailer for too long without respirators on, but we’re getting there. A month ago, we still had interior skins. We had just started taking them down. Boy, that feels like a lifetime ago. Since then we’ve popped out at least a couple hundred or so rivets, and away went the interior skins. We started by taking the cover of the AC unit down and removing all of the light fixtures so we could take down the ceiling. It was all one long skinny strip of metal skin, which was pretty satisfying to pull down. It was also a little nerve-wracking because, well, that’s it. Once you start pulling those puppies down, you’re full on committed to redoing your insulation and skins. Say bye bye to painting that 70s era vinyl wallpapered (??) metal and let ‘er rip, potato chip! After that, we then worked our way down the sides, leaving the end caps for last. We had several sessions of pulling this stuff down, and going home incredibly itchy – ugh – despite taking precautions to keep it off of our skin. Super annoying! The end caps were a little scary to take off. Not because it was difficult, it wasn’t. 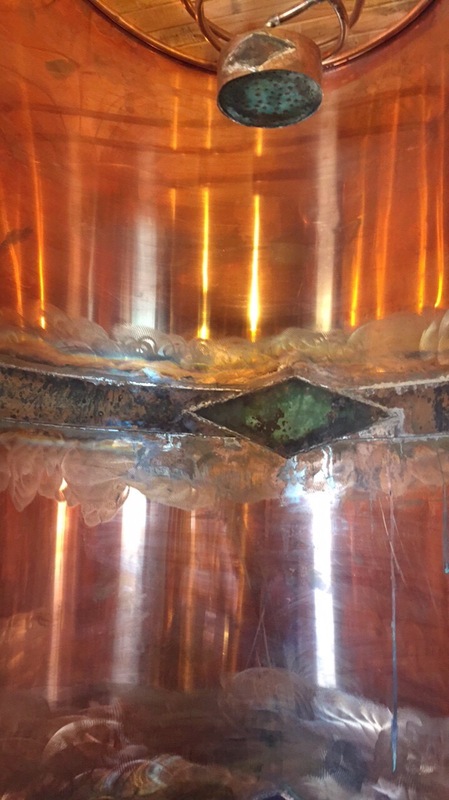 It was just the same as taking off all the other skins… But taking the end caps off and trashing them meant that we for certain were going to have to make new ones at some point, on our own, and have to account for that beautiful, dreaded, iconic, amazing, terrifying Airstream curve. If I haven’t already mentioned it, Vick and I met in remedial math class. We-no-likey-the-maths. But we did what we do, sucked it up and pulled them off, and vowed to figure that out when we got there. Thankfully, we’re not “there” just yet. The back side of our front interior endcap had 3267 Argosy written on it in permanent marker. I’m not sure what that means, but it’s cool to think that the last time anyone laid eyes on that was probably in the 70s at the factory. I’ll have to google it one of these days to see what I can find… unless anyone reading this knows what it means? Help a sister out! Once all of the interior skins were done, we were left with a big pile of scraps, tons of bags of the pink stuff, and a lot of little particles to shop vac up. At that point we were ready to get going on the floor. 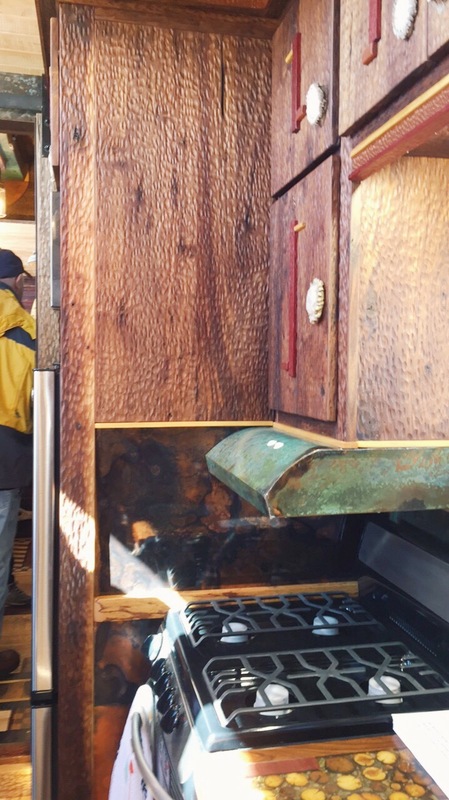 We had already cut up a small section of it over the gray tank several weeks ago and realized that it’d be better to remove all of the skins first, since the subfloor is bolted in behind them in several places. We’ve since gotten up most of the floor, with a circular saw, vise grips, a lot of muscle, and a lot of determination. Let me use this opportunity to say – I had several moments while removing the skins where I stopped to say to myself: “Why are we doing this? The insulation isn’t so bad and the electrical works. Is this really necessary?”. Seeing what we had under our floor had me vehemently answering YES YES YES. Definite evidence of rodents, moisture, and other general nastiness. GROSSGROSSGROSSGROSS. Had we just said “eh, it’s probably okay” and painted over it with no investigation, we would never truly know what we were living on top of, which would have been a nasty cesspool of icky. Right now, we have a makeshift plywood “floor” so we’re not walking around on the frame, which needs a few minor welds and a LOT of rust removal and POR-15 (not necessarily in that order). We still have about a third of the floor to take off, but we’re handling all the stuff in the c-channel and the bolts on the frame first. We’ve been twisting the bolts out with vise grips, which seems to work well enough and not take too terribly long. Folks keep suggesting an angle grinder, which I know will also do the trick, but I wonder how careful you have to be to protect the frame, opposed to just using a little muscle to pull them out with the vise grips? Anyone have an opinion? Put it in the comments! There are so, so, SO many things to pull out of an Airstream in order to get to the subfloor. The plan for today was to loosen or remove everything in the way of the floor. That means the fresh water tank, water pump, furnace, on-demand water heater, and the toilet. In the three-ish hours we were there, I pulled out the fresh tank, and Vick handled the furnace, and then both of us pulled out the ductwork. Because if you’re going to pull out the furnace, you might as well pull out the ductwork too. We aren’t totally sure we’re going to keep the furnace, anyway. It’s older and takes up a ton of valuable storage space. If anyone has any recommendations on space and energy saving alternatives, we are all ears! We did have to go primitive with standard hand tools for a bit for some hard to reach screws and bolts on the ductwork. We are so spoiled on power tools! I also loosened the on-demand water heater, which was affixed to the floor with a few three inch long screws. Once all of that was taken care of, the trailer was an absolute mess, and I didn’t want to proceed any further until we tidied things up a bit. We swept up as much debris as we could, except for what’s in the little nooks and crannies that are hard to reach – which is why we still have dozens of pop rivet mandrels left behind by Rosy’s previous owner (the little metal rods pictured below). They’ll get swept out eventually. Our toolbox desperately needed organizing, so we took care of that as well. We are typically so focused on whatever we’re working on, that once we’re done for the day at our worksite, tools are everywhere. We’re normally leaving the worksite in a rush to get home before Cowboys kickoff, so we usually just gather the tools as fast as we can and dump them wherever they fit in the box. This had gone too far, so I’m glad Arnavick instigated a toolbox organizing sesh – we were overdue. Suffice to say, after all that cleaning, we didn’t get to cross everything off of our list of items keeping us from getting to the subfloor. BUT, progress is progress, so we’re satisfied with that. We are a tad bit nervous about disconnecting the water pump and surrounding wires. Arnavick thinks some of the wires may be for the DVD/sound system our previous owner installed. To me, it just looks like a bunch of colorful cords. We have a friend that knows electrician things, so hopefully, we can get him out to take a look and give his expert advice. We also didn’t get the toilet out. We’ve been talking about this for weeks, but have been saving it for last. I feel like it’s best to pull out the ol’ pot just before handling the subfloor, just in case there are some icky fumes or minor biohazard situations that arise. We’ll already have everything else out of the way at that point, so it should minimize the impact of any potential issues. Now’s a good time for a before and after, don’tcha think? Now I feel much better, after seeing what a difference we’ve made in just under three months. After all, we both work full time (and then some), and I go to school and am active in school organizations, which leaves us only one day per week to work on the rig. Progress is progress, right? So who has hot tips on a space-saving furnace (pun always intended)? Or even full HVAC options? I’d love to get rid of the roof AC unit, too! Advice in the comments – go! This is not a sponsored or partner post (not that I’m not into that, wink). This is just a recap of an experience. Now that we’ve done that… OH. EM. GEE. you guys. 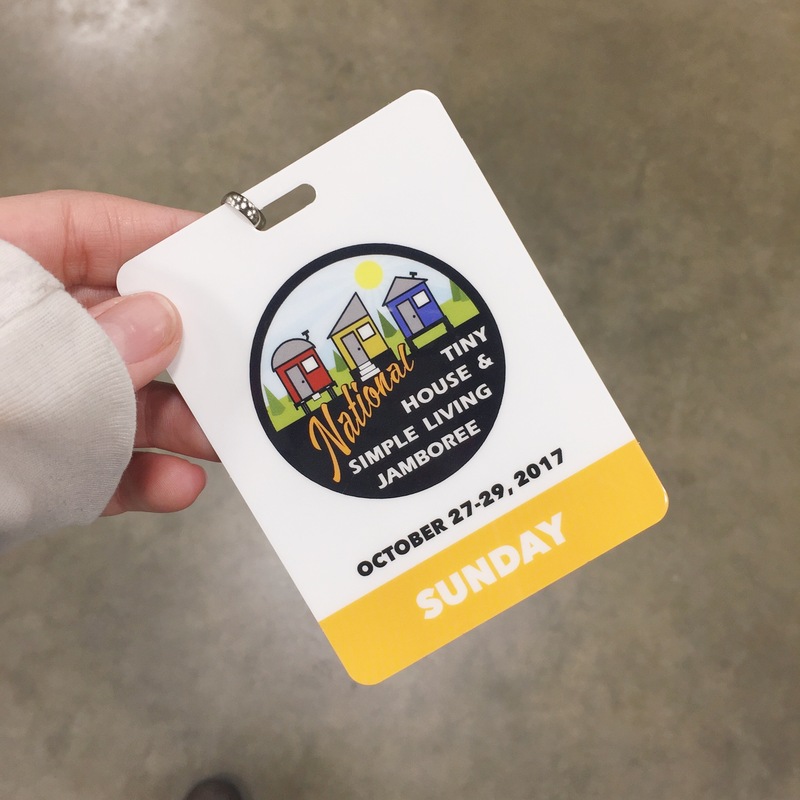 The Tiny House & Simple Living Jamboree was so much fun! I really loved being around so many like-minded people, and everyone we talked to was really helpful and encouraging. We went for most of the day Sunday, and in hindsight, we should have done a full three day pass. We didn’t really get the opportunity to sit in on any of the programs, which I know would have been really insightful and inspiring for us. But, we still got to tour all kinds of Skoolies, Tiny Houses, and Vans, and got some great advice from some truly amazing people. I think what I love most about this Tiny Living community is the enthusiasm and willingness to give advice. Not only are people happy to talk about their journey, they’re eager to hear about ours, and ready to uplift us and cheer us on. For every time I’ve uttered “we’re not totally sure what we’re doing”, I’ve been met with “you’ll get there”, or “you can do it”. I am immeasurably grateful for this positive and helpful wanderer tribe to which we now belong! Here are some shots I took of the event, and links where you can follow the fine folks behind these incredible dwellings! I wish I had taken more, but I’m still not so used to the idea of folks being eager for you to share pics of their homes on social media. Okay, first off, they gave me a badge, which made me feel so official (even though everyone got one)! Also, if you follow us on insta, you’ll know we made shirts. 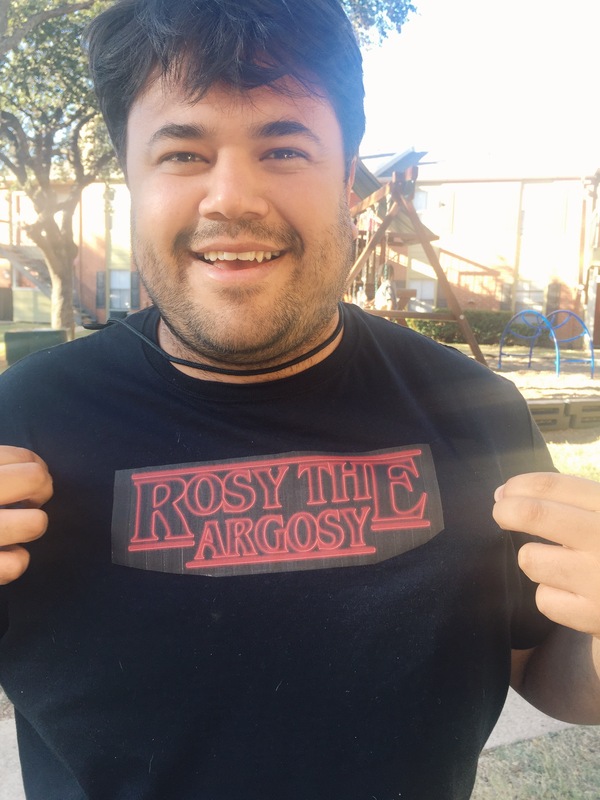 Arnavick did a Stranger Things theme and I did a more linear, color-blocked design. 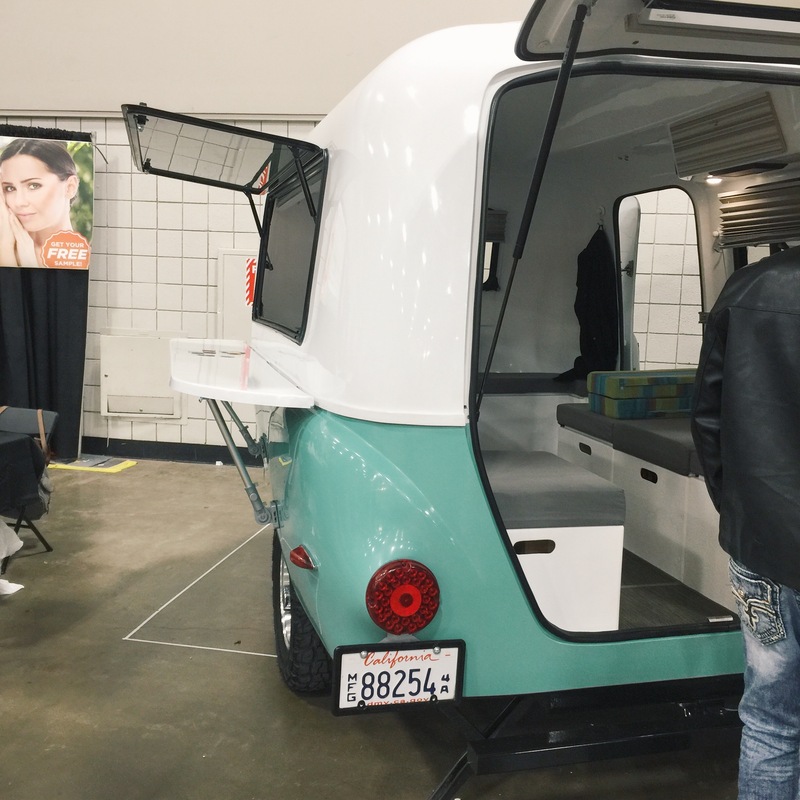 We got to see this little cutie by Happier Camper – super cute and great for small toy hauling. I, of course, loved all the color selections they offered. 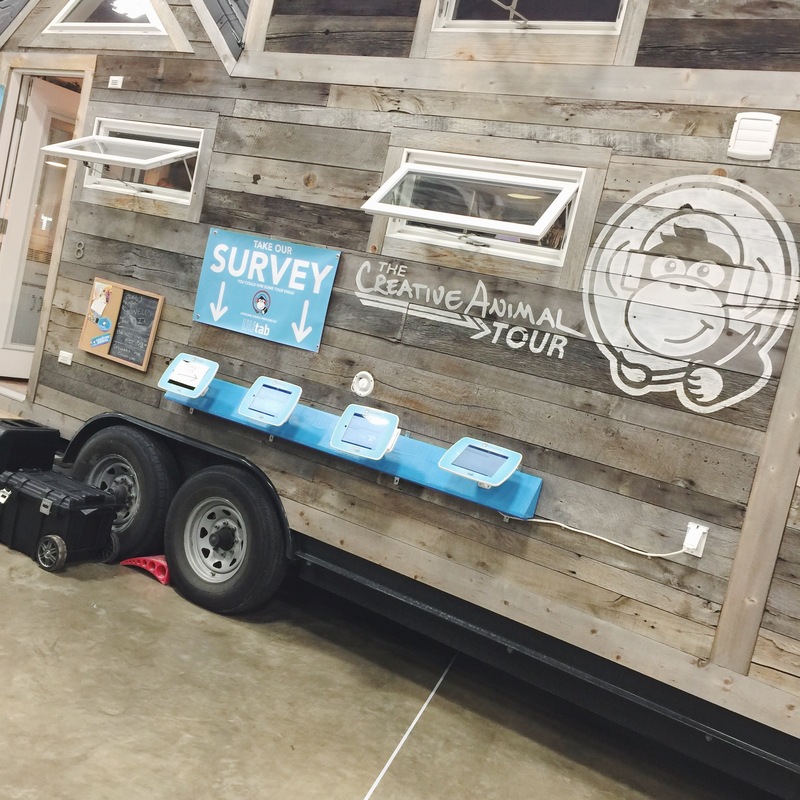 Our first tour was of The Creative Animal Tour Tiny House, which was awesome! 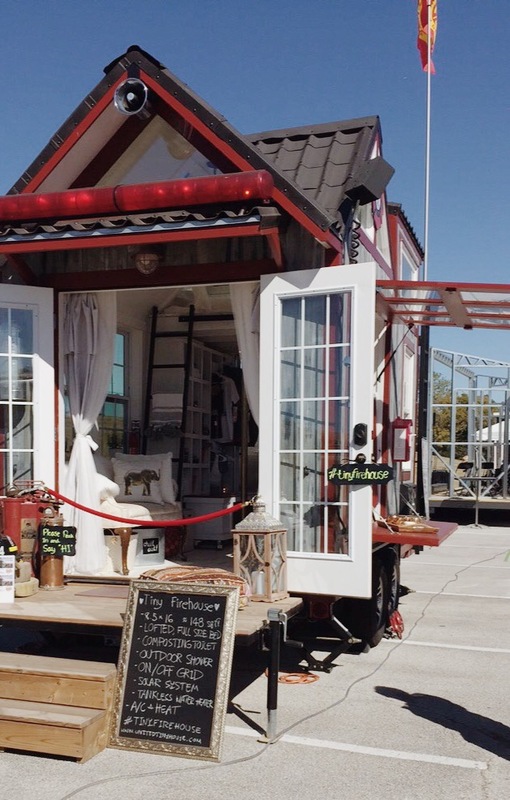 You may recognize them from HGTV’s Tiny House Big Living. We chatted with Steph a bit (who did the blueprints for the house) and she showed us some super cool features, like trap door storage in the “ceiling” under their loft bed. 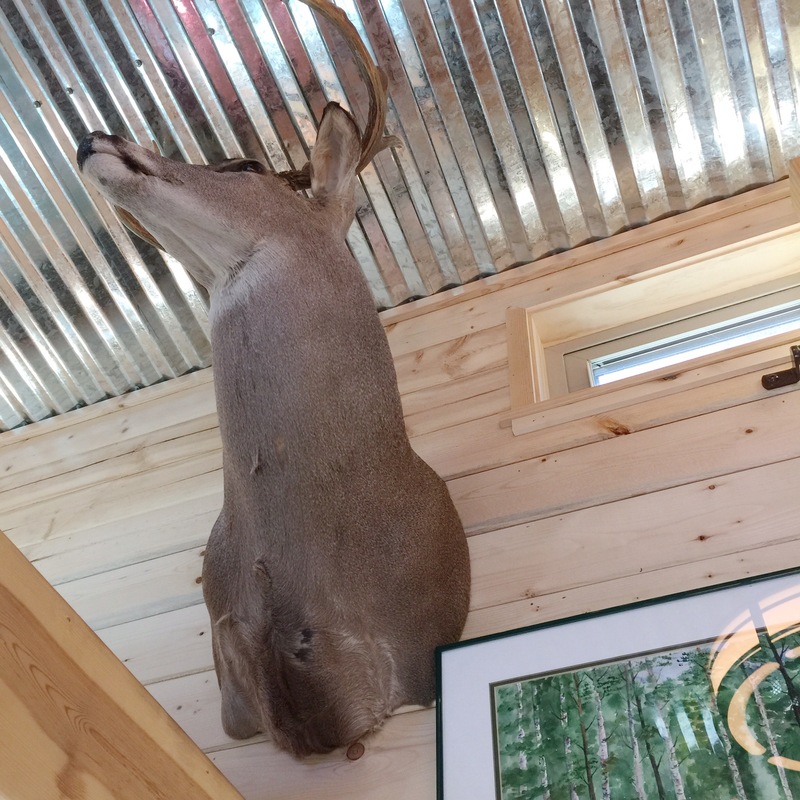 This tiny house looked like it could maybe be a super nice deer lease, if you’re into that kind of thing. 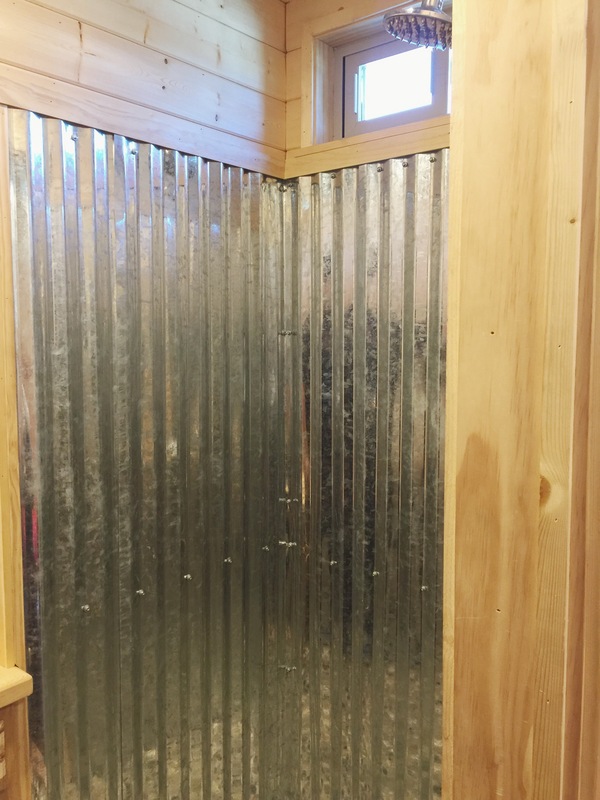 Love that galvanized corrugated metal throughout! 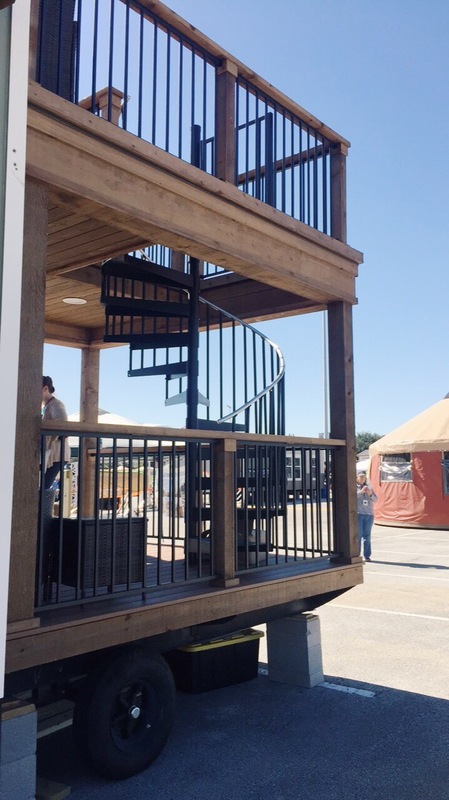 I was super impressed with this tiny house that had its very own spiral staircase and observation deck! The interior was pretty cute too. 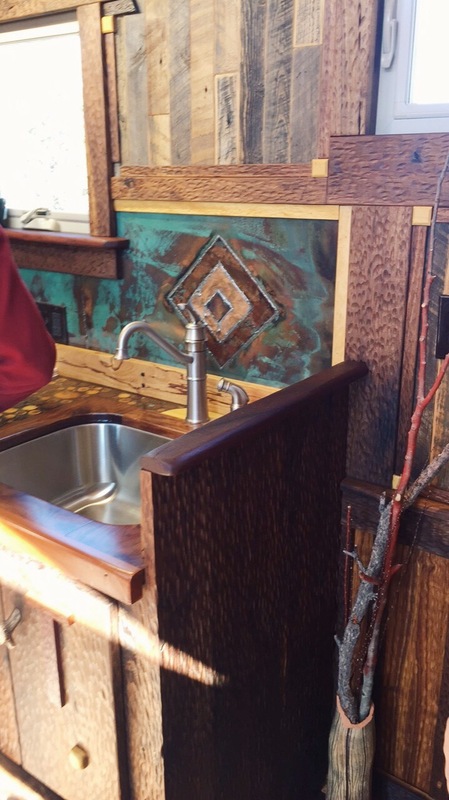 This tiny house by Red Deer Classics has insane hand carving and delicate woodwork, and the copper had a sick patina! I didn’t get an exterior pic – but you can check it out on their insta! We got to see this sweet little Airstream, and Airstreams always make us happy! 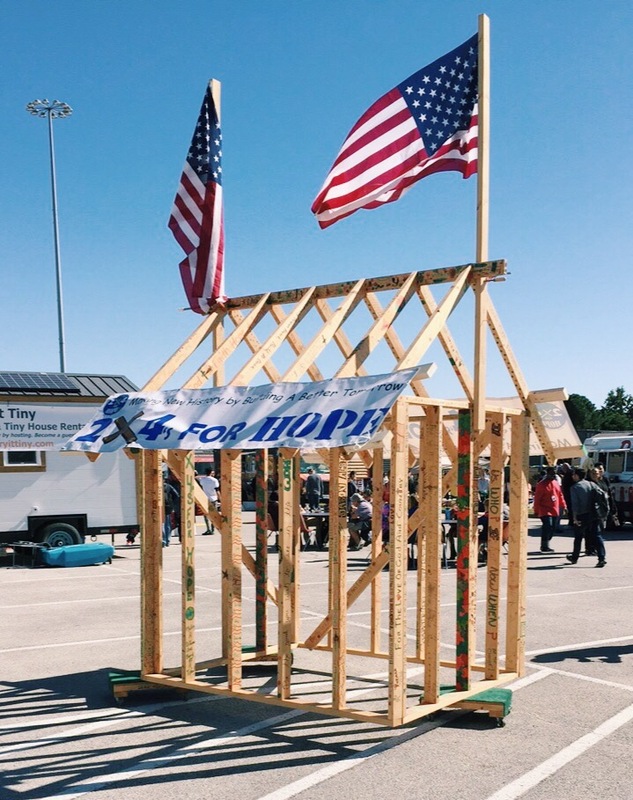 We bought a 2×4 from 2x4s for Hope and wrote a special message for veterans on it. 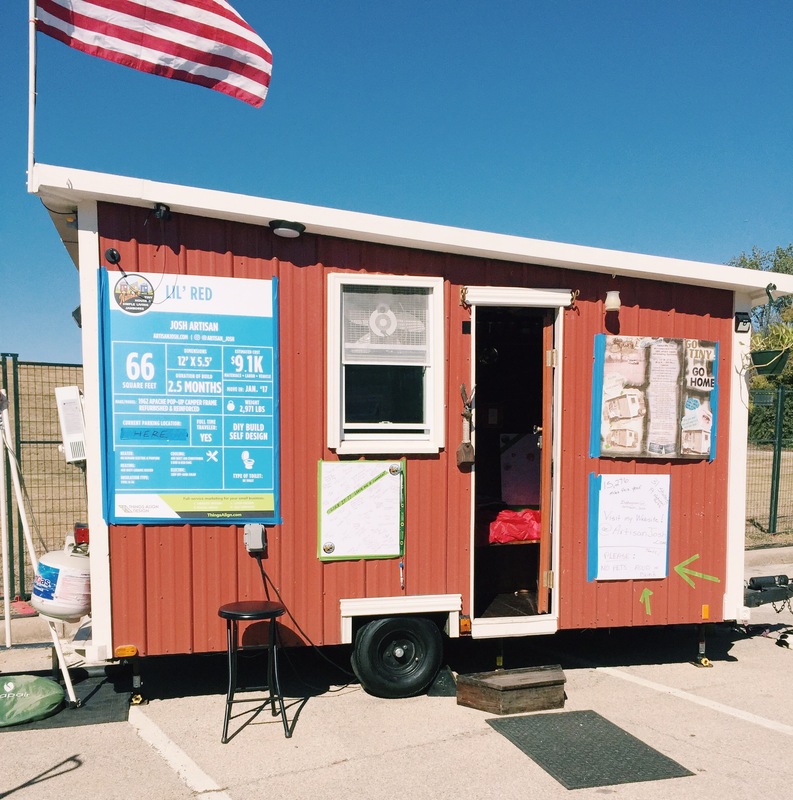 This organization is amazing – they build tiny homes for homeless veterans. 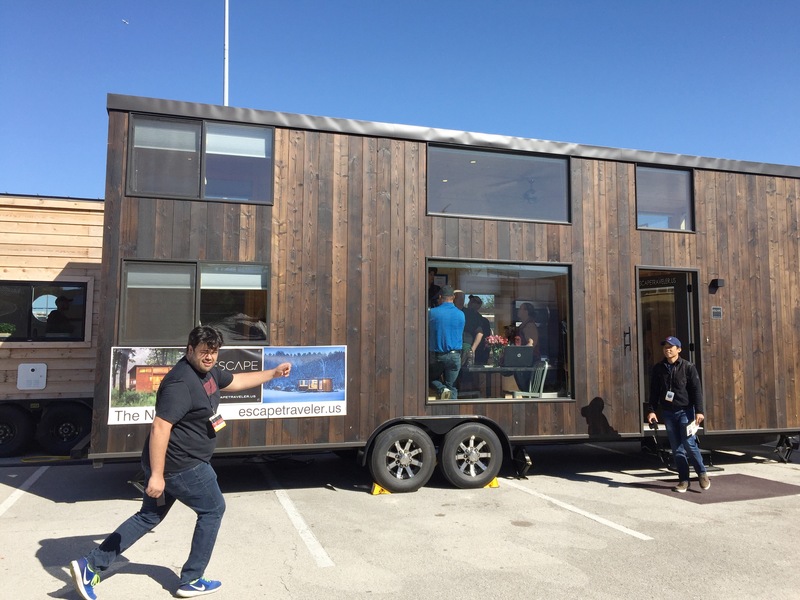 This was just their exhibit, obviously, not an actual tiny house! Check out their website (linked above) for more info or to donate! Arnavick really liked the look of this butcher block countertop. 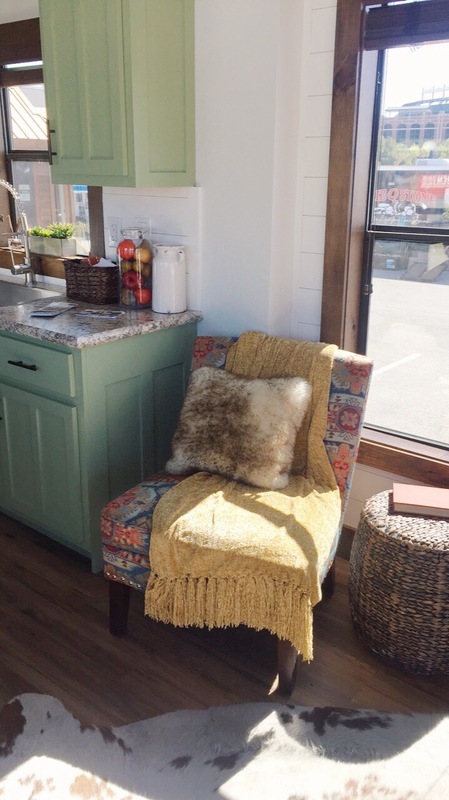 We’re considering this look for our little kitchen in the trailer. I really, really, realllly loves all of the skoolies! 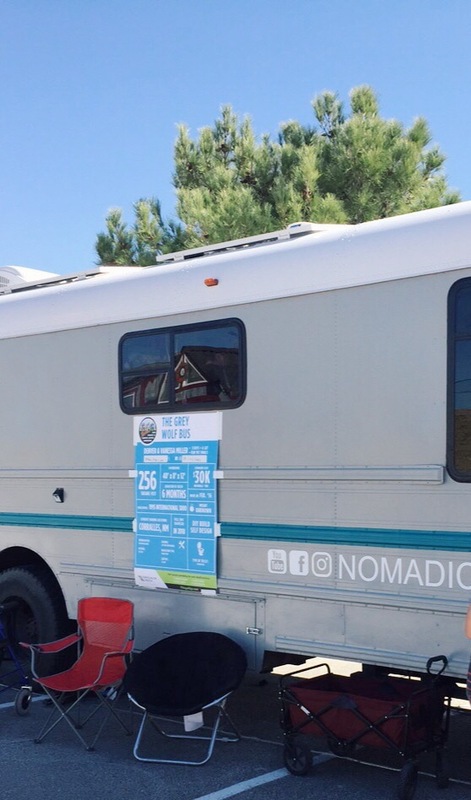 I’ve been following Nomadic Millers for a little bit now, and I was so jazzed to see their bus in person! 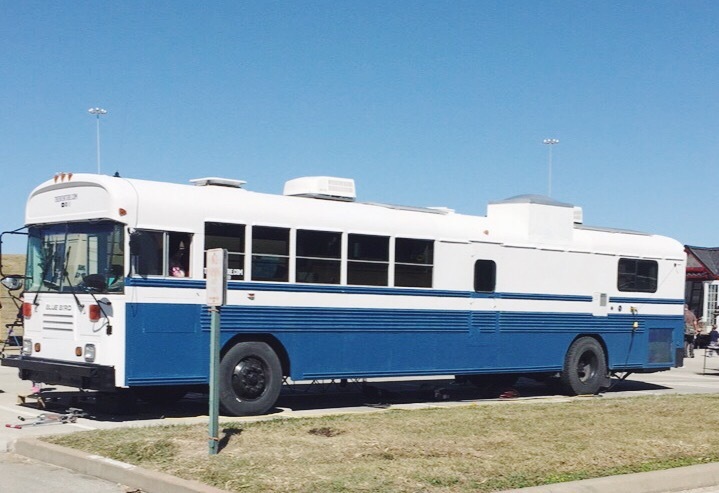 I only got one picture of the outside, and they were busy tending to kiddos while we toured, so I didn’t get the chance to tell them in person how cool their bus is, but it’s beautifully outfitted. 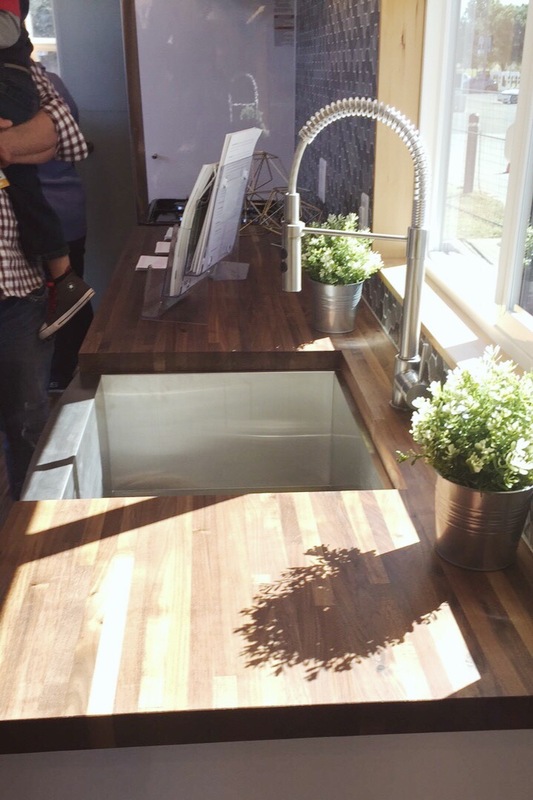 Check out their Instagram – THAT KITCHEN! Love. I hadn’t come across Trebventure on insta, but I’m really glad to be following them now. Not only was their home jaw-droppingly cool (excuse me they have a SKYLIGHT over their SHOWER), they were so sweet and encouraging! One of the questions I asked (which I’m sure they get a lot) is whether it was difficult to raise their kids on the road, since ‘Vick and I have hopes to start a family in the next few years. Ashley’s response was that having kids is just hard in general, but their simple lifestyle makes it easy, and that we can totally do it. It is so reassuring to see people living the way we’ve been dreaming of. Our crazy camper scheme isn’t so crazy after all. 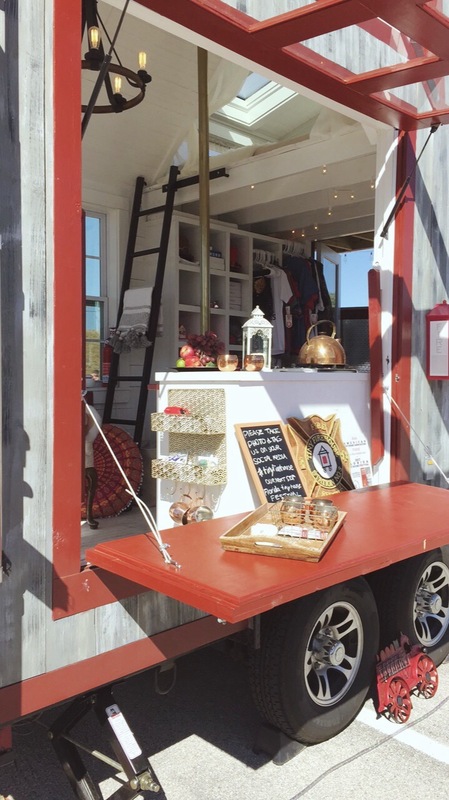 We got a kick out of the #tinyfirehouse! It has a fireman’s pole in it. It looks like a short slide down the pole but probably fun all the same. I’ve also been following tiny house expedition for a while now. 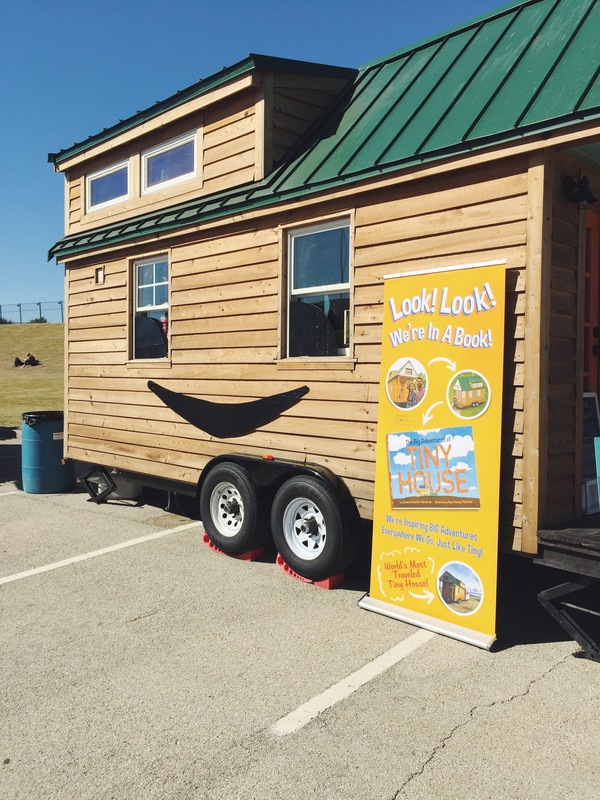 Sadly, I didn’t get to see the inside, but I was glad to see the outside of this happy little house in person! 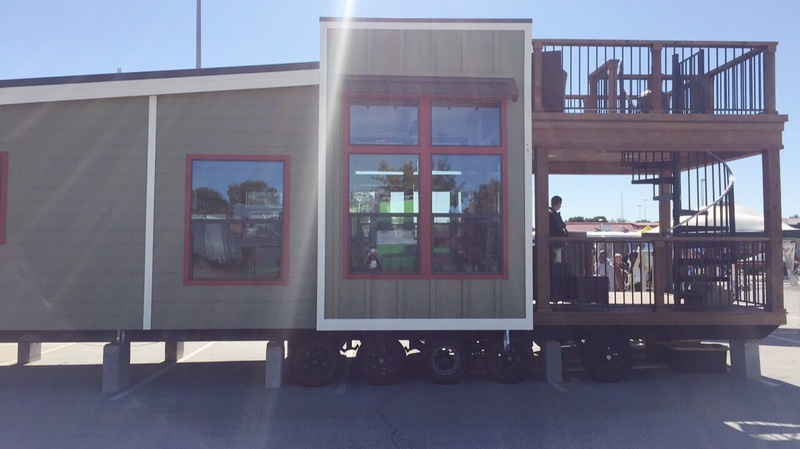 Their website has some really helpful info on tiny house living – check it out if you’re interested! Lil Red was a lil cutie! 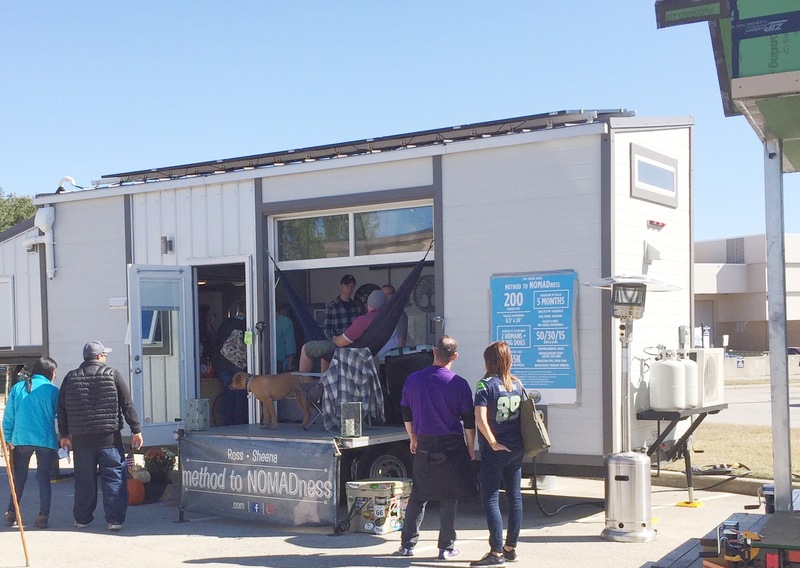 66 square feet – can you imagine?! I was super impressed by the functionality of this lil house. I wish I took inside pics! Last but certainly not least – method to nomadness. Much love to Sheena, who did not kick me out of their house during my excessive fangirling over the HAMMOCK that they have attached to their house! Genius. Seriously amazing. Kevin and Christy from lifetwogo are a couple of van lifers and were really lovely to talk to! 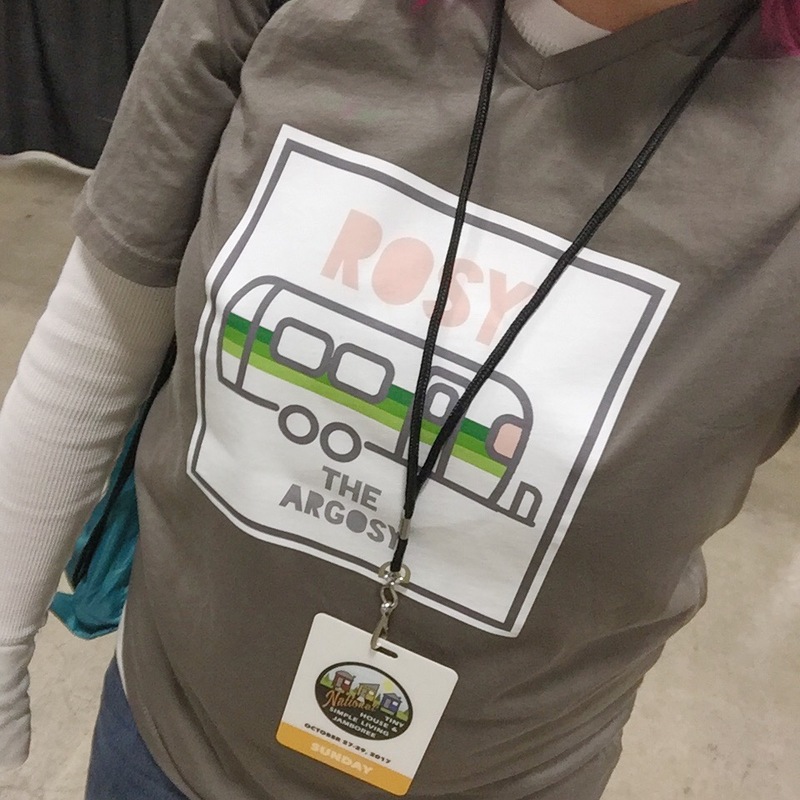 They were so encouraging, and they noticed my Rosy shirt and let us gush for a solid five minutes. We loved looking at their map and hearing about their travels! Samantha from GoneVananas answered a couple of pretty personal questions re: showering, and talked to us about composting toilets and poo for a good while – a true saint! It’s not every day you talk commodes with a complete stranger, but we are grateful for her tips! We toured This Little Home Of Mine at Earth Day last year, at which point it was only a shell on top of a gooseneck trailer with wood walls and sharpie outlines of Brittnie’s layout. We were so pumped to see the interior now that she’s almost completely done! She was a total sweetheart, and we are super impressed with what she’s done with her place! We had such an awesome time, and can’t wait for the next time we attend the Jamboree! Should be all shacked up in Rosy the Argosy by then! Who else attended? I’d love to hear your takeaways!